Say goodbye to traditional die cutting - the amazing new laser cutting and engraving machines from Hans Gronhi use the latest in laser techology to deliver spectacular results on a huge range of substrates. When you digitise the cutting process, the limitations of traditional die cutting are removed and a wealth of new design possibilities are opened up - along with new markets for you and your customers. Spectacular and intricate designs are easy to set up and achieve in minutes. Cutting is amazingly quick and accurate. 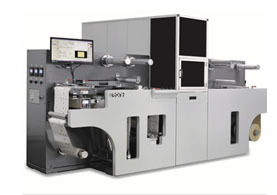 You can kiss-cut, cut, crease and etch at high speeds, from single designs to many multiples per sheet. 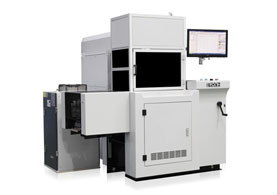 Available in sheetfed or roll-to-roll formats, a Hans Gronhi laser cutter can process a range of substrates including a wide gamut of printing papers, self adhesive paper, card, plastics, aluminium and copper foils, and even leather and wood. What’s more, like all our machinery, pricing is sensible - this is an affordable and practical solution, ideal for today’s commercial print marketplace. Whether it’s a run length of thousands or one, this is a cost effective innovation which could add something genuinely new and special to your business!